Ours is a unique country that’s recognised around the world for its caring nature, love of sport and innovative spirit. In 2007, four significant organisations that have helped shape our culture of today celebrated their centenary. Se-tenant Block of four 50 cent, one $1, one $1.50 and two $2 stamps. 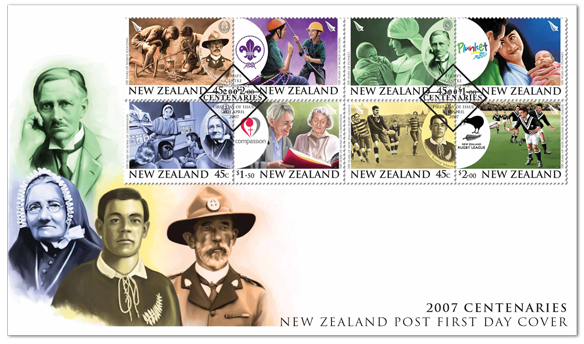 NZ Post marked these events by this issue of eight stamps with each organisation being represented by two stamp showing scenes from 1907 and 2007. The stamps have been designed with the older scenes being in one colour reflecting the photography of that time and the new scenes being shown in the full colour of modern photography. 50c -The Plunket Society 1907. $1.00 - The Plunket Society 2007. The Plunket movement began on 14 May 1907, when Dr Frederic Truby King (1858-1937) won the support of Dunedin women to form a society that would ‘help mothers and save the babies’. 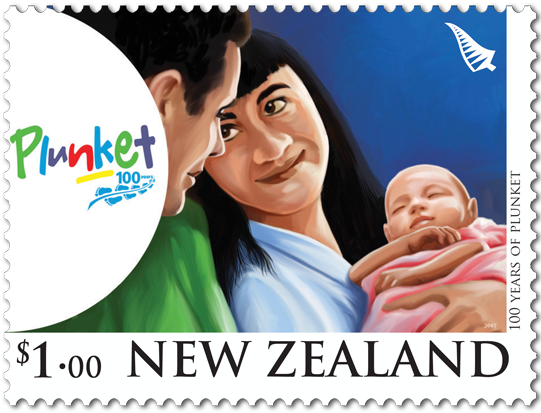 Today, Plunket continues to play a vital role in the lives of young families around the country. Plunket is now the largest provider of services to support the health and development of children under five. 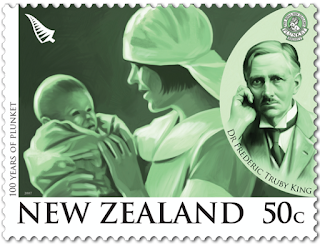 The 50c stamp depicts Dr Truby King, and a Plunket nurse caring for a baby in the 1920s. 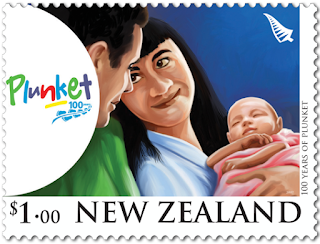 The $1.00 stamp represents Plunket as it was in 2007. 50c - Home of Compassion 1907. $1.50 - Home of Compassion 2007. 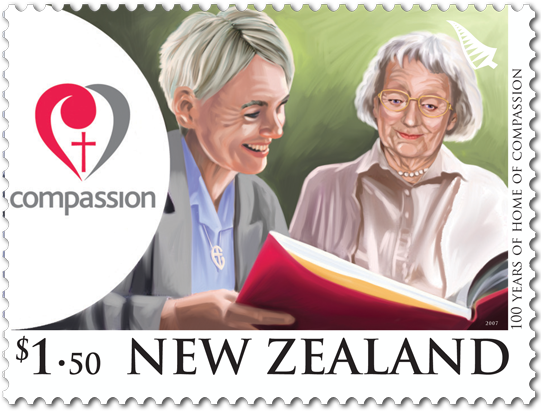 Suzanne Aubert (1835-1926), the founder of the Sisters of Compassion, has been acclaimed as one of New Zealand’s greatest women. She opened Our Lady’s Home of Compassion in Island Bay, Wellington, in 1907 to care for babies, children, the disabled, and extended it to establish a hospital to nurse the sick and elderly. Other Homes were built and today the Sisters continue the good work of Suzanne Aubert, throughout the Pacific. 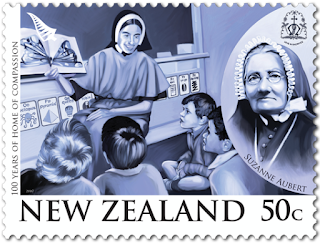 The 50c 1907 stamp featured a classroom scene at Our Lady’s Home of Compassion and Sister Suzanne Aubert. 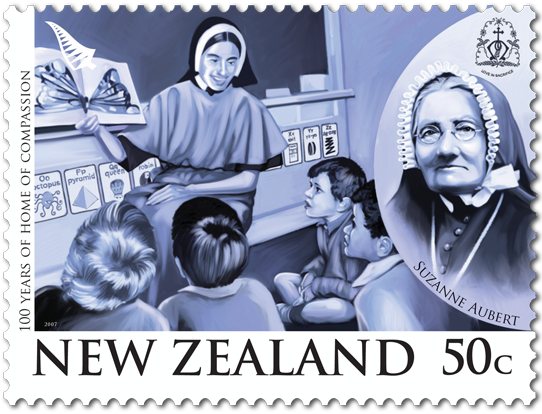 The $1.50 stamp depicted the continuing good work of Suzanne Aubert today. 50c - New Zealand Rugby League 1907. 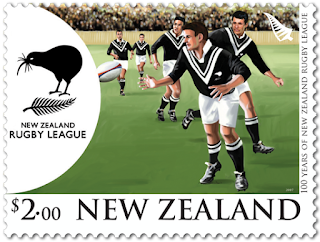 $2.00 - New Zealand Rugby League 2007. In August 1907, a pioneering New Zealand rugby league team toured England, Wales, Ceylon and Australia playing 49 matches, winning 29, drawing three and incredibly winning both inaugural test series against Great Britain and Australia. It was an incredible feat as the New Zealanders, on leaving their shores, didn’t know the rules and English league had been established for over 12 years. The inaugural captain of the league team was Hercules Richard Wright, a powerfully-built man aptly nicknamed ‘Bumper’. The first rugby league team of New Zealand, the ‘All Golds’, is shown in the 50c stamp. The $2.00 stamp showed the modern-day 'Kiwi' team. 50c - World Scouting 1907. $2.00 - World Scouting 2007. An experimental camp run by Robert Baden-Powell on Brownsea Island (UK) in 1907 saw the beginning of the largest youth movement in the world. In 1908 Lt. Col. David Cossgrove (1852/1920) organised this movement in New Zealand. He had met Baden-Powell in South Africa while on army service there. The two had similar ideas and values, teaching boys and girls moral values, patriotism, discipline and life skills through outdoor games and activities. Today there are more than 28 million scouts in 216 countries and territories around the world. 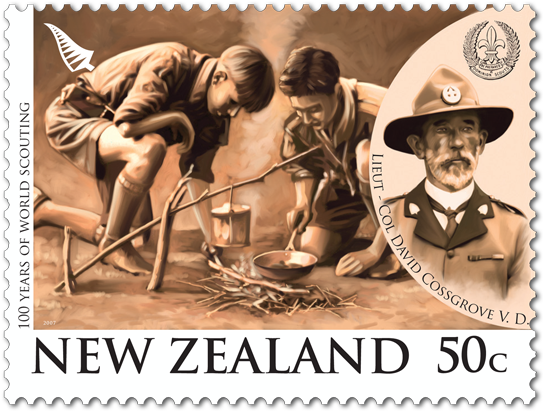 The 50c stamp shows Lt Col David Cossgrove, and early Scouts learning self-reliance. 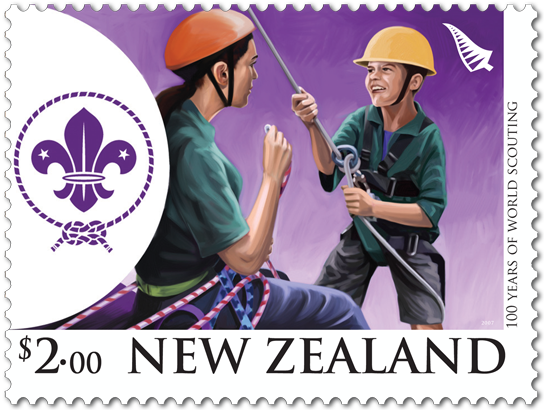 Today, Scouting still teaches traditional values as shown on the $2.00 stamp. First Day Cover - 24 April 2007. The First Day Cover shows four people from 1907, representing each of the four organisations celebrating their centenaries. Date of issue: 24 April 2007. Number of stamps: Eight gummed stamps. Denominations: 50c, $1.00, $1.50, $2.00. 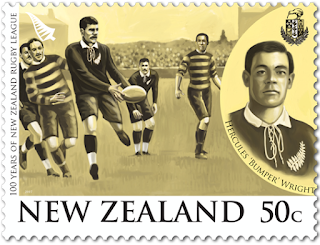 Stamps and first-day cover designed by: Stephen Fuller, Wellington, New Zealand. Paper type: 104g Tullis Russell red phosphor gummed stamp paper. Number of stamps per sheet: 20. Perforation gauge: 14 x 14. Special blocks: Plate/imprint blocks could be obtained by purchasing at least six sheet stamps for $1.00 or $1.50 value. Eight sheet stamps for 50c value, and $2.00 value. Barcode blocks were available in both A and B formats. Period of sale: These stamps remained on sale until 23 April 2008.